The Coen Brothers (Joel and Ethan Coen) have had critical acclaim with their feature films. Directing more than 15 movies together and spanning different genres, the brothers have classic hits with such films like Fargo, The Big Lebowski, and No Country for Old Men, which garnished several academy awards for Best Picture, Best Director, and Best Adapted Screenplay. In addition to their directorial filmmaking, the Coen Brother also lend a hand in screenplay writing (mostly to their owns films) as well as other film endeavors including Unbroken and Bridge of Spies. Now, with Universal Pictures, the Coen Brothers present their newest film with the satire comedy to old Hollywood in Hail, Caesar! Does this movie play homage to Golden Age of filmmaking or is it too much nostalgia of Hollywood yesteryear? Eddie Mannix (Josh Brolin) is the head of production at Capitol Pictures, working hard to manage the movie studio (and its features) as well as keeping Hollywood scandals from their big time stars out of the headlines. Contemplating a new job offer from Lockheed Martin, Mannix latest ordeal deals with the disappearance Baird Whitlock (George Clooney), a big time, yet somewhat idiotic actor recently kidnapped by a group of Communist looking to score ransom money for their cause. With production of the movie “Hail, Caesar!” halted with Whitlock’s disappearance, Mannix also juggles the recasting assignment of Hobie Doyle (Alden Ehrenreich), a recent cowboy star sent to act in theatrical drama piece from illustrious director Laurence Laurentz (Ralph Fiennes), but can’t quite overcome his several limitations as a performer. In addition to that, DeeAnn Moran (Scarlett Johansson), is the studio’s beloved aquatic ballet lead, who’s recently found herself pregnant and in need of quick solution for her situation, while Thora and Thessaly Thacker (both played by Tilda Swinton) are gossip columnist siblings who are on the prowl for the latest juicy scandal. As a movie enthusiast, I’ve seeing most of the Coen Brothers films, with fan favorite hits like No Country for Old Men, Fargo, The Big Lebowski, and True Grit (the 2010 version). However, while I like those movies, their other movies like Burn After Reading and The Ladykillers were odd and little “kooky” (to me at least). Moving on, I remember seeing the trailer for Hail, Caesar! and was completely intrigued by its all-star cast and its old Hollywood backdrop setting. I even said it was one of my most anticapted movies of 2016 (placing at number 9). After seeing the movie, I found that Hail, Caesar! was presented well (having the star power and the perfect homage to the glory Hollywood moviemaking), but is unfocused and lacks that extra drama “oomph” to the proceedings. The Coen Brothers have done Hollywood before with their 1991’s film Barton Fink, examining the surreal and satirizing film industry with a vision of insanity. Hail, Caesar! is their second attempt to re-enter Hollywood through their cinematic lens, paying homage to the films that were commonplace during the 50s era of Hollywood. To me, this was the best part of the feature with Hail, Caesar!’s movie “within a movie”, which showcases in-production features at Capitol Pictures, whether is the big theatrical epic of “Hail, Caesar!” (a clear representation of the Ben-Hur movie) to the Busby Berkley-style ballet pool sequences to the tap-dancing Gene-Kelly-inspired musical number to the old spaghetti westerns. I only wish these scenes could’ve been longer. Similarly, the movie doesn’t take itself too seriously, which is sort of a good thing. Hail, Caesar! plays out more like a comedy satire, with everything playing out in some form of a “wink” or quirky off-beat humor. It’s a visual motifs of old Hollywood is another great representation of the feature, exploring the iconic (yet somewhat stereotypical) work of Hollywood’s Golden Age, with characters moving from set to set and performing their roles with theatrical boldness that was normal during that time. Everything from authentic production design to costumes, it’s easy to say that Hail, Caesar! is indeed a beautiful and well-crafted film about a film studio that makes movies. Unfortunately, Hail, Caesar! doesn’t escape its own fair share of problems. While it perfectly presents the “Golden Age” of Hollywood and all its nuances, it also examines other events in 1950, including the paranoia of a post-Atomic bomb era, the secretiveness of Soviet Union, and rise of communism. All of this, as well as the movie’s main story of following Eddie Mannix, proves that Hail, Caesar! has a lot to tell in its 106 minute running time and this is where the main problem lies. To me, the movie showcases a lot of ideas and concepts that don’t exactly payoff and come across as half-baked ideas. In addition to that, the movie’s screenplay (which was written by the Coen Brothers) is very loosely structured, some much that it meanders and deviates from the main path a little too much. There’s some many minor characters and minor subplots that the film has a hard time to juggle and interweave all these story threads together. Ultimately, Hail, Caesar! is a feature that’s made up of smaller stories, lacking focus and a strong narration. Lastly, the movie’s trailer is sort of misleading from what was shown to what the movie actually is about. I know movie trailers can be a little deceiving and Hail, Caesar! falls into that category. The cast of Hail, Caesar! is a stellar cast, with an assemblage several recognizable Hollywood actors ranging from well-knowns to “A-listers”, most of whom have been in a Coen Brother’s movie before. Collectively, they’re a talented bunch, drumming up their comedy angsts or dramatic poise for their roles in this Hollywood satire. Josh Brolin is, more or less, the main character of the feature (and has the most screen time of the entire cast) as the quick-witted / quick-thinking Eddie Mannix. Personally, Brolin fits perfectly in this movie, having the “look” and “vocal tone” of 50’s man and has the right amount of a repartee with his co-stars and inner vulnerability. Additionally (in case you didn’t know), Brolin’s Mannix is loosely based of real-life Hollywood “fixer” Joseph ‘Eddie’ Mannix. Interesting. In terms of screen time, Alden Ehrenreich is next in line. Indeed, Ehrenreich gets to show off his comedic work as the simplistic redo western star Hobie Doyle. Truthfully, he gets one of the funniest scenes in the movie, with actor Ralph Fiennes. As it turns out, “A-lister” actor George Clooney has a much smaller role in Hail, Caesar! than how the trailer portrayed him as with the character of Baird Whitlock. Whitlock, a popular star at Capitol Pictures and who’s not as intelligent as he portrays to be, is another addition to Clooney’s catalogue of roles in his filmography. Sure he’s a dimwit character, but Clooney plays it with great ease and seems to enjoy playing the part. The rest of the Hail, Caesar! cast only show in a handful of scenes, some of which are only one or two scenes in the film (I.e. Jonah Hill and Frances McDormand) and are only thinly caricatures that meant to reflect real-life Hollywood iconic personas. This includes Scarlett Johansson’s DeeAnna Moran (inspired by Esther Williams), Ralph Fiennes’s Laurence Laurentz (inspired by Laurence Olivier) and Channing Tatum’s Burt Gurney (somewhat inspired by a Gene Kelly persona during his main sequence). Other characters are more purely designed for comedy relief and clearly designed at such like Tilda Swinton’s duo role as the gossip columnist writers (Thora and Thessaly Thacker) amongst several others. Most of these characters aren’t fully developed to be well-rounded personalities, but they’re still entertaining and play to the movie’s comedy farce. 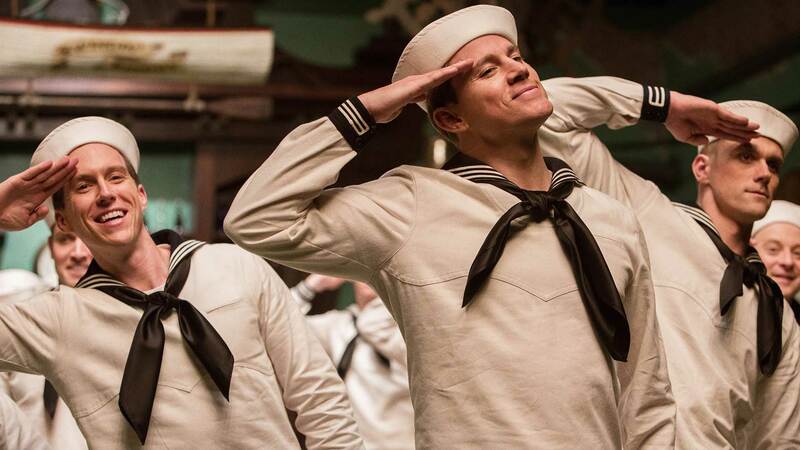 Its light, camera, action with the comedy satire Hail, Caesar!. The Coen Brother’s newest film is salute to the 50’s era of Hollywood, paying homage to the studio hustle-bustle of moviemaking during its yesteryear heyday. Its stylish and well-made and sometimes pretty funny, fitting a classic comedic romp of the genre, while also showcasing the show-biz of studio entertainment. Unfortunately, it’s more an unfocused madcap of a feature, with the loosely-structure narration (with underultized characters) and numerous tangent subplots that don’t exactly panned out. Overall, Hail, Caesar! will mostly likely be spilt, between movie gurus (who will probably appreciate it) and average moviegoers. To me, I’m somewhere in the middle between those two prospects. Hail, Caesar! may not be the Coen Brother’s best picture, but it’s is a movie for cinephiles, movie buffs, and film aficionados who love movies during the Golden Age of Hollywood.